This one dish Coconut Caramel Pumpkin Oatmeal Skillet Cookie takes just 10 minutes to prepare and is the definition of a perfect fall dessert. Coconut flakes and rolled oats are stirred into a pumpkin oatmeal cookie base and baked in the same pan that it was mixed in. It's then topped with additional coconut, oats, caramel sauce and ice cream to create the seasonal dessert of your dreams. This Coconut Caramel Pumpkin Oatmeal Skillet Cookie is one of those recipe ideas that once it was in my head, I obsessed about it until I could test it to see if it would work. It's actually a variation of my Cherry Chocolate Chip Oatmeal Skillet Cookie which I haven't made in far too long. For some reason, I've been about pumpkin-ing all the things this fall, but I can't really say anyone has complained! 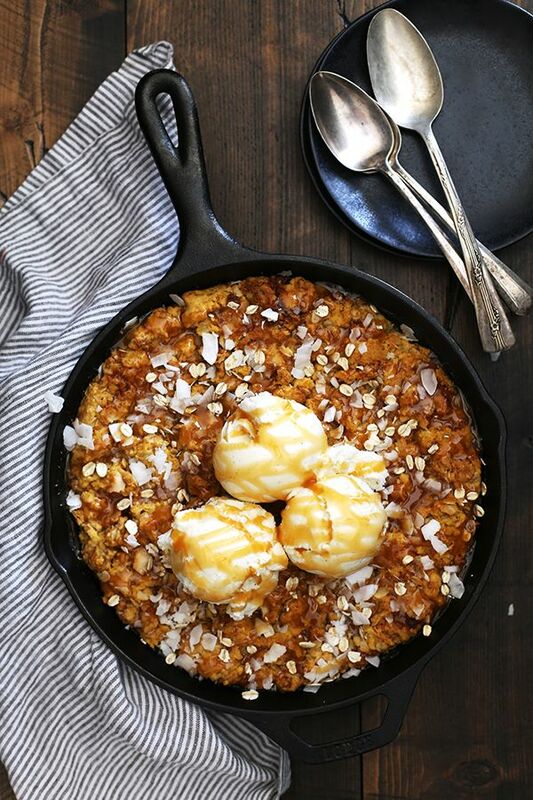 We've enjoyed this Coconut Caramel Pumpkin Oatmeal Skillet Cookie twice in the last week. You know, for the sake of recipe testing and all. Wink, wink. Sure, my husband gave me a hard time because I included so many ingredients in the title, but I wanted you to know exactly what you were getting into with this dessert. Pure deliciousness, that's what. And the fact that it's all stirred together in the single pan that you bake it in? Well, that's pretty darn genius as well. Less washing dishes, more enjoying dessert. That's really how life should be. -In a 10″ cast iron skillet, melt butter over medium-low heat. Stir in sugars and vanilla and remove from heat. Let cool for 5 minutes. -Stir pumpkin into butter and sugar mixture. -Stir in flour, oats baking soda and salt until combined. -Stir in Caramel Bits and coconut flakes. -Bake for 25-30 minutes, until beginning to brown, but still soft in the center. -Served topped with caramel sauce, additional coconut flakes and rolled oats, caramel sauce and a scoop of vanilla ice cream, if desired. 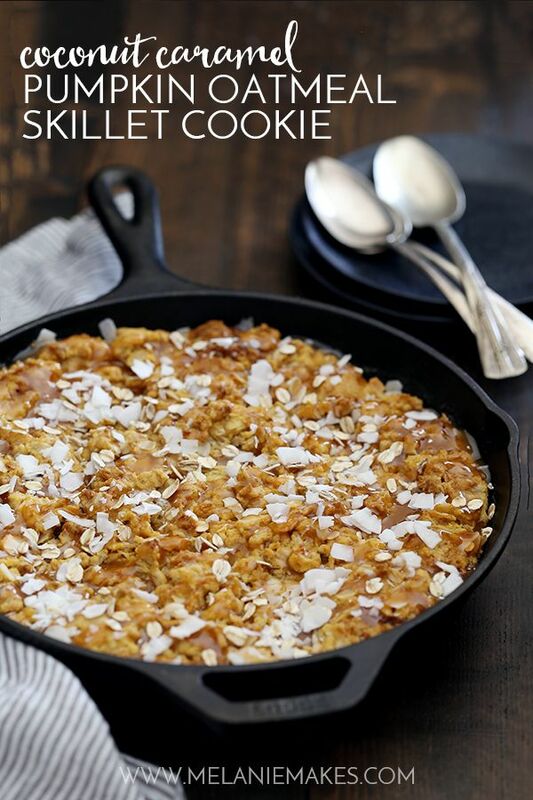 The post Coconut Caramel Pumpkin Oatmeal Skillet Cookie appeared first on Melanie Makes. This tart is the perfect combination of beauty and taste! 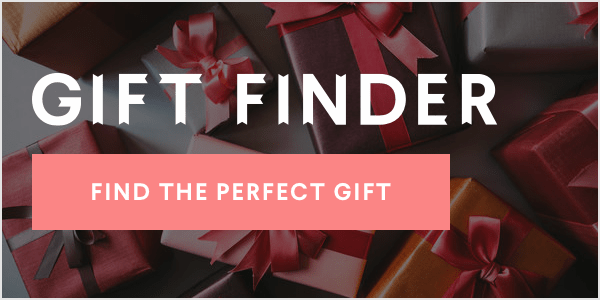 The best dessert to bring to any gathering or holiday party.